Congratulations on Stepping into your SUPERWELLNESS! Enjoy gamechanging HEALTH and WELLNESS tips with Dr. Edith Ubuntu Chan. Be empowered to cultivate vibrant health & life-long wellbeing. Have ENERGY to do all the things you love! 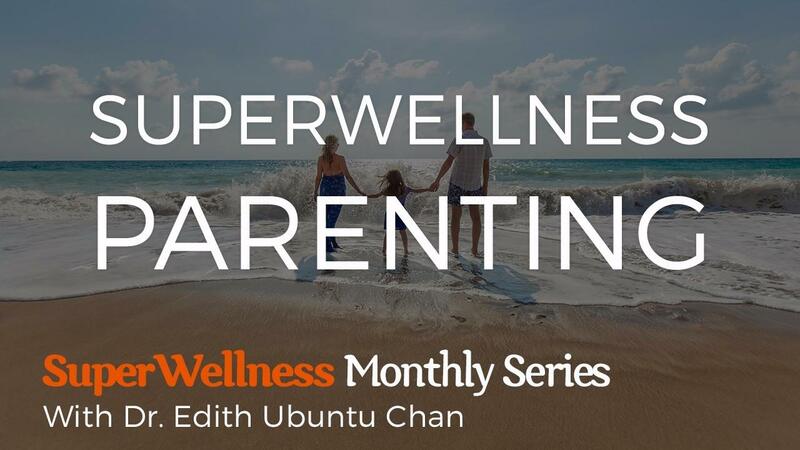 In this webinar, find out about SuperWellness parenting. All sales are final. There are no refunds offered for monthly Webinar replays. By registering for this Webinar replay, you confirm that you have thoroughly reviewed and agreed to the Disclaimer, Legal Liability Waiver and Cancellation policy prior to registration. This webinar is for entertainment & educational purposes only. It is NOT intended to diagnose or treat any medical conditions. Within the context of this webinar, Dr. Edith Ubuntu Chan is serving as educational speaker - and NOT as your medical provider. Always consult your doctor in a timely manner for any medical concerns. Never change or discontinue any doctor prescribed medical treatment without consulting your doctor first. In this webinar, any comments made by Dr. Edith Ubuntu Chan or any other participants are NOT to be taken as substitute for individual medical advice. You hereby forever release, waive and discharge any claims against Dr. Edith Ubuntu Chan, The School of Dan Tian Wellness, LLC & associates. You confirm that you're using this product solely for your personal entertainment or education and take full responsibility for your own action & results. Copyright 2016-2017 - Dr. Edith Ubuntu Chan / The School of Dan Tian Wellness, LLC / SuperWellness. All rights reserved. Do not duplication, copy, or distribute in any way, either wholly or partially, without prior written authorization. All sales are final. There are no refunds for monthly Webinar replays.